Monday's strong increase in W/SW and SW groundswell continued to provide plenty of size yesterday morning with variable winds and clean conditions across most breaks, coming in at 3-4ft on the Surf Coast magnets and 4-6ft to the east. Today the swell has dropped away further and conditions are average to poor with moderate to fresh onshore southerly winds. The end of the week isn't too special swell wise, though winds will be generally favourable for both coasts at stages. We'll see a morning E/NE breeze across the beaches east of Melbourne tomorrow though we'll only be looking at a weak mid-period S/SW swell to 3ft on the sets. The Surf Coast looks only small and to 1-2ft, while a weak E/SE windswell should be seen into the afternoon with SE sea breezes. Come Friday conditions should clean right up across both regions with a dawn N'ly breeze, tending N/NW through the morning ahead of an early afternoon SW change. Size wise the Mornington Peninsula isn't expected to offer much over a small fading 2ft, with 1-1.5ft of easing SE windswell on the Surf Coast. Moving into the weekend, and Saturday will start small to tiny SW tending S'ly winds, though the Surf Coast may see an early W'ly, but no size. 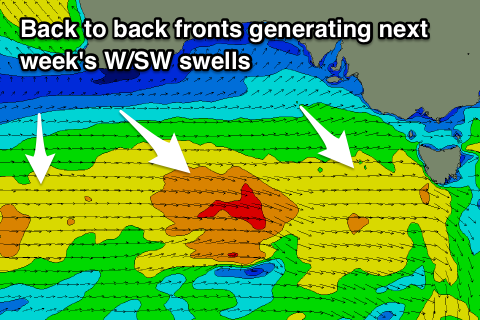 Into the afternoon and more so later in the day we should see some new long-period SW groundswell filling in. This has been generated by a strong though distant low that developed in the Heard Island region and has since pushed east along the polar shelf. It's since weakened, with the swell due to arrive Saturday and build to the inconsistent 3ft range on the Surf Coast by dark, if not for the odd bigger sneaker and 4-5ft+ to the east. The swell is due to ease through Sunday from an inconsistent 3ft and 4-5ft respectively as winds swing offshore and out of the NW for the Surf Coast, tending SW early afternoon. We've got a more consistent and prolonged W/SW swell event from early next week, as a polar front projecting up and towards us is followed up by stronger mid-latitude fronts over the weekend and next week. The initial front will develop east of Heard Island and project a broad fetch of relatively weak W/SW winds slowly towards us, likely reaching gale-force once moving under the country, pushing across Tassie early Sunday. Behind this a secondary front will generate an additional fetch of strong to near gale-force W'ly winds on top the active sea state Sunday followed by a third and strongest front. We should see moderate amounts of W/SW swell building Monday, with stronger levels of groundswell for Tuesday and Wednesday. Size wise we're looking at surf peaking around the 4ft range on the Surf Coast and 6ft+ to the east with W/NW to SW winds Monday/Tuesday and then a swing to E'ly winds from Wednesday. More on this Friday though. Perfect timing Huey, waves for days. Yeeeww!